The greatest gentleman privateer of his era, Cliff knows honor demands that he see this beautiful wild child to London and into her socialite mother's arms. He's aware that Amanda is utterly unprepared for a debut in London's ton, so his only recourse is to become her guardian and champion her transformation into a lady...and find her a suitable match. But with every passing moment it becomes harder to deny his jealousy and ire, until Amanda makes her stunning debut, a lady at last. And when his passion is finally released, their love can no longer be denied. ©2006 Brenda Joyce (P)2006 Audible, Inc. This book isn't the best of the genre, but it delivers -- a little tension, a hero and heroine I can root for, and, of course, romance and a happy ending. The book is a little formulaic, but it is so nicely done, I cannot complain. Our hero is an Earl's youngest son, renown privateer/merchant/rake (I am not sure which of the three comes first ;-) Our heroine is a rough-and-tumble pirate's daughter, under the hero's charge, who undergoes a Pygmalion transformation by the end of the story. I preferred the relationship at sea, when she had a little more fiestiness to her. Sadly, once she hit dry land and the Ton got ahold of her, the story/characters all became a little more mundane. That said, there is definite chemistry between the two throughout the book (well, sexual tension really -- the word "virile" comes up regularly, and while our heroine remains a virgin for much of the book, she certainly isn't "innocent"). The story includes a couple of kids who occasionally have annoyingly adult-like dialogue, particularly the precocious daughter, thankfully she rarely appears. These are by-blows of our hero, but he raises them openly/lovingly -- in fact, if there is any complaint about him, it is that he is just too nice, sometimes a little broody darkness helps fill out a character. While our hero is torn by his attraction to his charge, he is pretty darn honourable about it all (well, mostly, when he isn't being "virile"). The narrator is a man (which is the first for me in a historical romance novel) -- I enjoyed it. The accent is North American, which might bother some people since the setting is 1800s Ton Society. If you need your English/Irish/Scottish characters to sound English/Irish/Scottish, you might be bothered, but he worked for me. Listen to the sample to decide. I give this book 4 out of 5 for delivering what was expected, a nice little romance. A sea captain and a pirate's daughter. There was something so touching and sweet about this story. I almost missed work because I had been up all night reading it. Amanda is so desperate she offers herself to the governor in exchange for her father's pardon. Her despair, pain and vulnerability are so palpable despite her attempts to hide them behind her tomboysih and defiant exterior. The scene at her father's hanging brought tears to my eyes. Cliff DeWarrene's reaction to her plight and the way he came to her aid won me over. He was truly an honorable man. And he sincerely tried to think of her as an innocent child that needed to be taken care of, offering her his protection without expecting or even accepting anything in return. I found myself laughing out loud when I saw his jealous outbursts while he still denied his feelings for her. Brenda Joyce was very adept at developping these 2 characters and building/evolving their relationship. The sexual tension between them was always there, but she also took the time to build their friendship and their respect for each other. The fact that Cliff still preferred Amanda as "La Sauvage" versus the lady endeared him to me even more. This is basically the story of a gentleman sea captain, an unlikely damsel in distress with a lot of heart and spirit, a love story amid pirates, London's aristocracy, and the Jamaican Islands. What can you ask for more. If you can get past the first 3 (4?) hours of constant yelling of "papa, papa," you're ok. The story was very nice, I liked the characters, but this "papa" thing was REALLY driving me nuts. If I were to really read it, it probably wouldn't have bothered me as much since I would've just skipped that part, but listening to it was just unbearable and it made me cringe. Also, the ending was a bit brief. I wished for more 'happily ever after' and that they would be described as happy parents. An entertaining "Pygmalion", "My Fair Lady" themed story with a different setting and time era. Instead of the 'flower girl' there is the pirate's daughter and the 'professor' is a prosperous daring sea captain from a noble family. I loved the story and couldn't stop listening to it once I began. Great story and fabulous narrator! Finally, an audio romance I couldn't stop listening to! 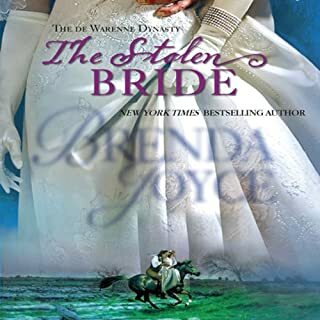 I love Brenda Joyce's books, and normally paperbacks are my preferred versions. But this narrator really makes all the difference. The story line is a lot of fun, and the chemistry between the hero and heroine characters are played wonderfully. I got a little impatient with the length, but that didn't take away from me wanting to listen all the way through. 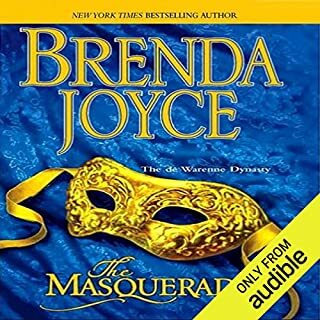 I hope to see more of Joyce's De Warren Dynasty series on Audible, especially read by Boutsikaris. Great storyline and excellent narration will always earn five stars my judgment, as I'm a very picky audio romance listener! 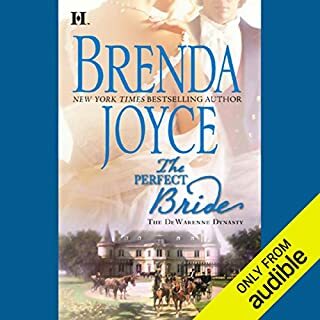 I had just listened to "The Perfect Bride" by Brenda Joyce and narrated by Jennifer Van Dyck so I thought I'd try this one. By comparison, I was extremely disappointed with "A Lady at Last" - hated the North American reading, inconsistent accents, little girl sounded like she was older than the heroine, and a hero who was a first class twit. I'm going back and listen to "A Perfect Bride" again and deep six "A Lady at Last." I might have liked the story better if someone like Simon Prebble or Richard Ferrone had been the reader, but I definitely will steer clear of any historical romances set in Britain that are read with a North American accent in the future - it was just too irritating. 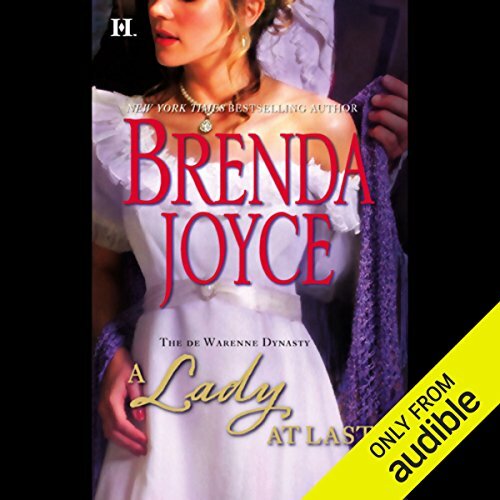 Where does A Lady at Last rank among all the audiobooks you’ve listened to so far? I loved Cliff. He was so manly and believable. He was intense without being a stereotypical male romance type. No, but I loved his voice. It was nice to listen to. Adventure, romance, and love with a pirate twist.